Despite the title of this vintage recipe card, I doubt this is a true southern spoon corn bread. But I have no doubt that it would be a delicious addition to anyone's Thanksgiving table this year. True spoon bread is to be eaten with a spoon and is more of a souffle than a bread (at least according to the trusty internet). 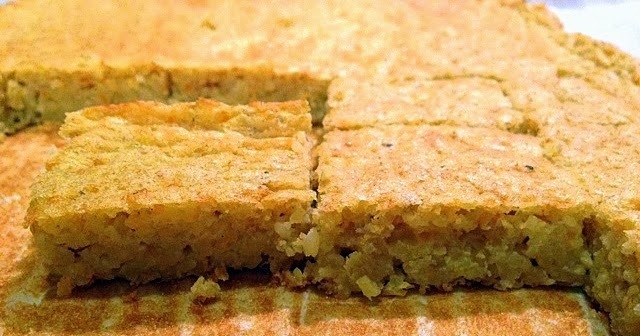 This corn bread may look like typical corn bread, but it is very, very moist -- not typical at all of traditional corn bread. And despite the fact that it contains no corn, something about its texture fools the palate into thinking otherwise. It also tastes fairly sweet, surprising since only a small amount of sugar is called for. So if you want to add something new to your Thanksgiving meal this year (and who doesn't? ), let's get started. This couldn't be easier to make. 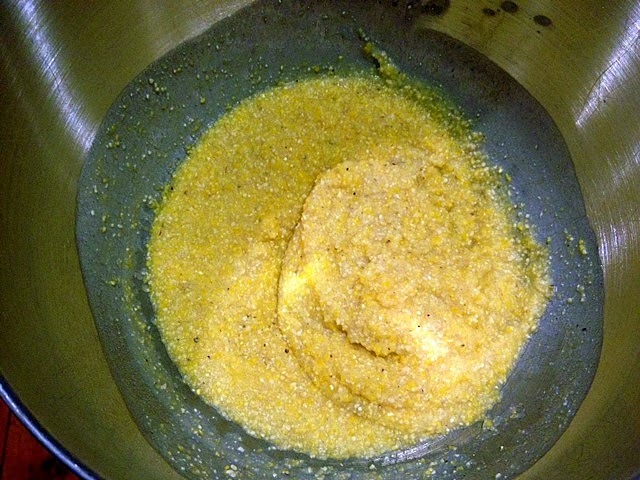 Add boiling water to cornmeal and let it sit until cool. 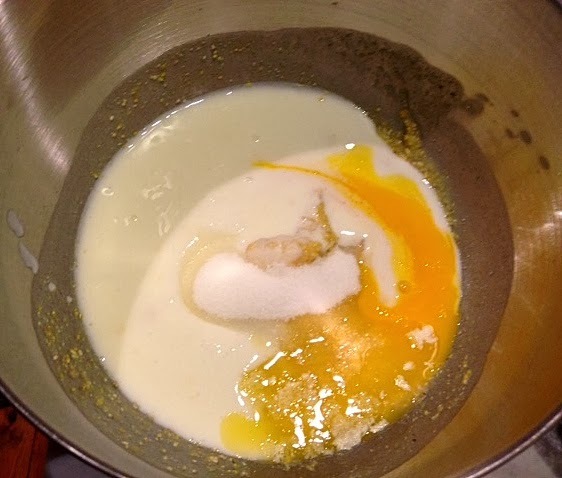 Next, add the buttermilk, egg yolks, melted butter and the dry ingredients. 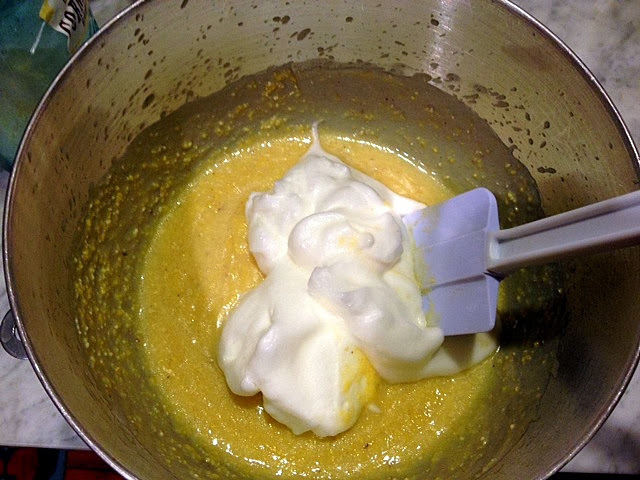 Blend together and then fold in stiffly beaten egg whites. Pour into a pan. This is where it gets tricky. The recipe cards says to use a pan where the batter is less than two inches deep. Having had my cup batter runneth over recently, I opted for a 9 x 12 pan. 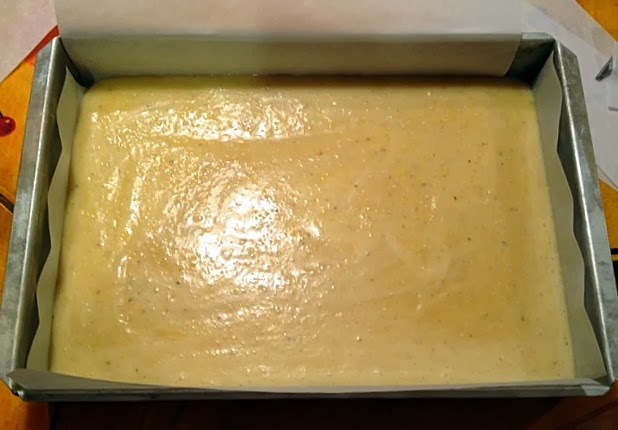 My guess is using a smaller pan would result in the corn bread having a more pudding-like texture (and probably require a spoon to eat). Production notes: I used melted butter for the fat, and supermarket buttermilk for the sour milk. I misread the recipe and used three eggs instead of two, which may have accounted for the extra moistness. YUM, this looks good. 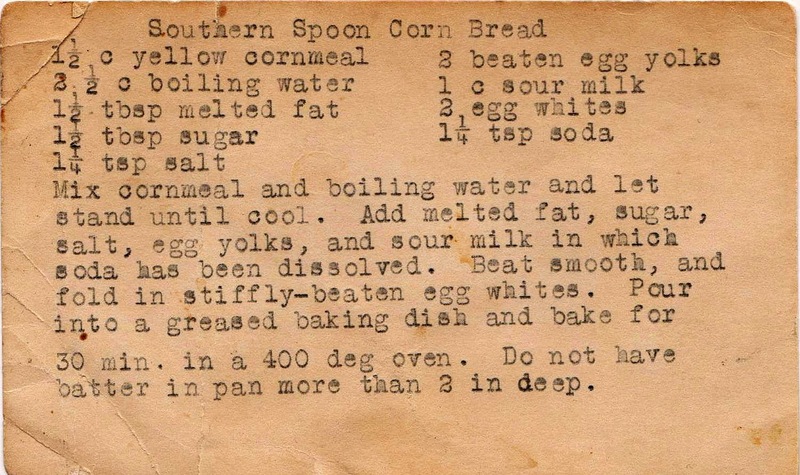 I live in the South, and I have never had spoon bread. That may qualify as a cultural faux pas, so I need to correct that. Thanks for the recipe! My pleasure, beckster. Everyone who had some at work really liked it!